Making Kombucha is simple and delicious! In a world where it can be difficult to get the probiotics you need from your regular diet, kombucha is an easy addition that is a great source of probiotics. It is mildly sweet with a little tang, much like apple cider, so it is easy to tell when it is ready. For people with food sensitivities, controlling what goes into their food is of the utmost importance. Making kombucha at home gives you a total control of the ingredients. 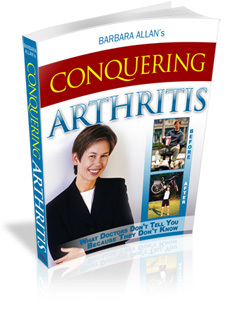 Armed with this knowledge you can continue down the road to complete healing. Make and store your newly made kombucha tea in a glass container. It pulls the toxins out of your body and it can do the same with a plastic container, which you do not want happening before you drink it. Metal containers, on the other hand, are damaging to probiotic cultures, which minimizes the culture’s good effects. 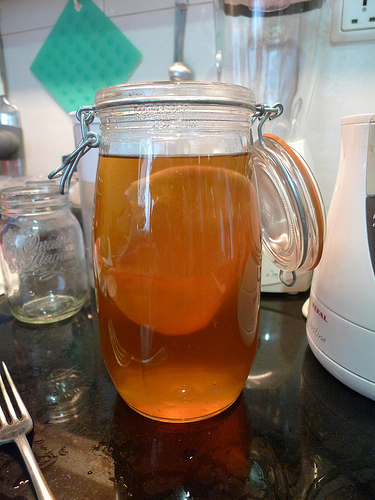 If you want to store the kombucha culture (often call a “mother” or scoby), this is possible. I do this when I don’t want to immediately make another batch of kombucha tea. The culture looks a little like a rubbery pancake. It is what houses the complex array of bacteria and other microorganisms that convert regular tea into kombucha tea with it wonderful array of probiotics. To store the culture place it in a fresh batch of sugar/tea mixture (the same mixture you make for fermenting a new batch of kombucha) but instead of leaving the culture out at room temperature, store it lightly covered in your refrigerator. I have stored my culture this way for up to a couple months at a time. I think you should be okay with your combucha and scoby in a glass pickle jar. The important thing is that the kombucha and the scoby not touch the lid for any significant period of time. It would be best if it didn’t touch it at all, of course, but the coating on the metal should keep the scoby healthy if it touches it briefly. If it is growing well, the scoby should still be healthy. re: kombucha tea recipe: I have had very severe cripping RA resulting in much damage and I will react to sugar. Additionally this recipe doesn’t say what the starter is. Is it made with a dairy starter or a non dairy and if so which one. I need a non diary starter and no sugar. which recipes are suitable for me please? This recipe is not for you, since you react to sugar. The komucha culture is non-dairy, but it does need sugar to grow. Some people have tried to use honey, instead of sugar, but honey has antimicrobial properties that can interfere with the culture. Will the tea be effective without sugar? I rarely eat sugar. Instead I go without it or use honey? Could I leave out the sugar or use honey instead? I also rarely eat sugar. The sugar in the kombucha isn’t for you, it is for the kombucha culture. The culture uses the sugar to grow. Once the tea is finished there is almost no sugar left. You must add some sort of simple carbohydrate to your kombucha culture in order for it to turn the tea mixture into the finished product, kombucha tea. Honey is not a good choice because it has many antibacterial properties. It will harm the bacteria that are part of the culture. It will stunt or kill many of the microbes that make the good probiotics that are a part of the finished kombucha tea. I signed up for your 6-month coaching in January this year. A year into my elimination diet and meditation regime, I've gone from 7-8/10 daily pain to 1-2/10 daily pain. Those meditation have been profound for me and helped me gently release very old deeply buried pain. Yesterday, I even accidentally ate cheese at a Christmas party, and wow... no increase in pain or headaches today...!! I'm so grateful for your guidance and encouragement on this incredible healing journey.